the papaya factor: No fuss Bread!! This entry was posted on 8:08 PM and is filed under Food and diet , My life , Quick recipes . You can follow any responses to this entry through the RSS 2.0 feed. You can leave a response, or trackback from your own site. Looks so yummy. Let me see if I can succeed at this. you are a cook,lady.take a bow.the bread looks perfect. baguettes are meant to be soft? i thought they were slightly tough and crusty, not that i know anything much about this at all. saw julie and julia and loved the film.btw, what did you make of avatar? This is excellent, thanks for including the links as well. My children have made pizza from that store-bought pizza dough mentioned, but did not know that baguettes could be made as well. Will certainly try this out, and Happy New Year to you and your family. they look yummy. wow no need to knead is super good news! 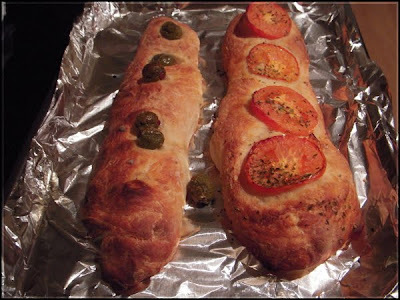 Yword - Thanks, tho you can see the olives falling off the baguette, so there's always something lacking in the execution :) They're not meant to be soft. By airy, I meant the holey insides that baguettes should have. We were snowed in the day we planned to watch :( I hope we can make it this weekend ... stupid snow! Happy NY to you and your family!! Samir - Sure thing! I'm hoping the reverse works out, I still have batches of the dough so I'm going to try making pizzas at some point (knowing me, I'll probably get impatient before the book gets to me). Enjoy!! Happy NY to you and your family too!! I can not view the photograph in office but am sure as soon as I reach home am gonna have a dekho!!! You know what I have been dying to bake? Cookies!!! Know some good reciepe??? Smita - I dont bake cookies much but I have a couple of recipes bookmarked. What kind were you thinking of? Here are some from my favorite chefs online - the best part is all are relatively low fat recipes. I've made the biscotti with chapatti atta and they were delicious but they're not traditional cookies. Let me know if you try any of them!! Thanks :) will give them a dekho from home!